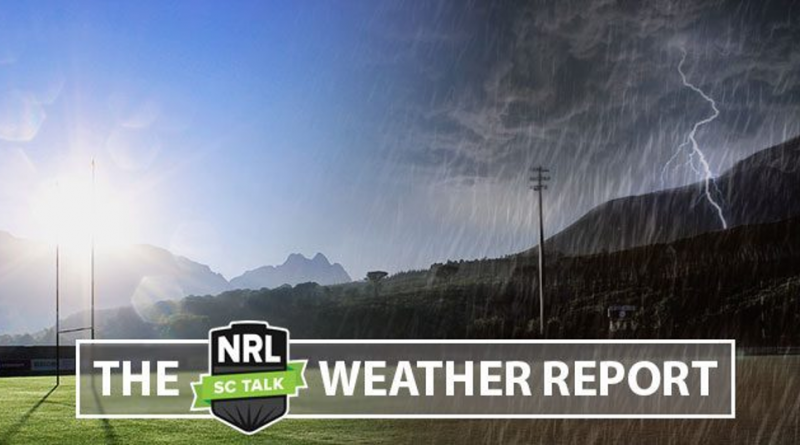 In summary, some matches may again be affected by some rainfall at some point in the game (including a chance of a storm on Saturday’s matches, and this afternoon and evening in Canberra), however this is expected to have less of an impact than last week. Friday Showers and thunderstorms are expected around the Canberra area this afternoon, including some possible rain areas. Heading into this evening, there is expected to be a general easing trend, however the chance of rain happening at any time during early evening game remains more likely than not. Humidity levels are expected to be low, and should there be no rain during the game, a moderate to high dew rating is expected in the second half. Friday The isolated heavy showers currently around Brisbane are expected to move inland and clear this afternoon, with fine weather this evening for the Fri night match. Game temperatures will be warm, along with moderate humidity levels, but these are unlikely to make an impact upon player comfort given these are two QLD teams. A moderate dew rating is also expected. Saturday There may be one or two showers or storms moving across Sydney during Saturday afternoon, however the chance of one of these moving across Cronulla during the mid afternoon match is relatively low. Game temperatures will be fairly warm, in the mid to high 20’s, along with low to moderate humidity levels, however the skies are expected to be fairly cloudy which will aid in the player comfort not being hugely impacted. Saturday Similar to the earlier match at Cronulla, shower and storm activity developing to the west of Sydney will also move into the Newcastle region during the early evening match. Moderate humidity levels will cancel out the small decrease in temperature compared with the earlier match, with a small impact on player comfort levels expected during the first two Saturday matches. Saturday Any isolated shower or storm activity is most likely to have moved north through the Central Coast/Newcastle area by the start of the match at Brookvale, however there is still a small chance of any rainfall during the match. Moderate humidity levels are expected during the match, which will make a small impact on player comfort levels. A moderate northeasterly breeze will limit the amount of dew able to form on the playing surface, with a low to moderate rating. Sunday Fine but fairly hot weather is expected at Homebush for the Sunday afternoon match. Fortunately this will be combined with low humidity levels, so player comfort levels are not hugely impacted. Sunday There is a slight chance of a shower or storm during the evening, otherwise it will remain fine at Campbelltown for the Sunday evening match. A moderate dew rating is expected in the second half. Just keep the Sydney radar open on the radar app on your phone just to make sure there’s no storms inbound!